Book the Springtime/National Cherry Blossom Festival Package at Hilton Garden Inn Tysons Corner and receive daily complimentary breakfast for two (2) , complimentary Hotel Garage parking ($6 value per night) as well as one (1) $10 DC Metro pass. 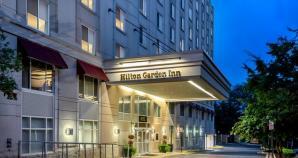 Hilton Garden Inn Tysons Corner is set in the heart of Tysons Corner—one of the DC area's most vibrant districts. Located just off the Capital Beltway I-495, this Tysons Corner hotel is within 20 minutes of the two major Washington DC major airports (Dulles International Airport (IAD) and Reagan National Airport (DCA)) and less than 25 minutes from the attractions of downtown Washington, DC. We are near the Metro Silver Line, which runs through Greensboro and the Tysons Corner Station. Discover superb shopping at Tysons Corner Center with stores including Bloomingdale’s, Armani, Nordstrom and American Girl. Work smart in our complimentary 24-hour business center or from your room with complimentary Wi-Fi access throughout our Tysons Corner, VA hotel. Choose your favorites in the Garden Grille & Bar, with a cooked-to-order breakfast and tempting evening menus. Wind down with a beer in the Pavilion Lounge, and use your in-room refrigerator and microwave to enjoy snacks and drinks from the 24-hour Pavilion Pantry®.